Proudly serving local brides since 1992. We salute our network of reputable, top quality wedding professionals, who help brides achieve their dream wedding and take the stress out of planning it ! Windsor and area brides and grooms choose us first for our upscale, printed wedding planner and socially interactive, bridal community website. We are the wedding web portal for this region and our preferred Wedding Professionals love weddings and it shows! Newly engaged? You have come to the expert website for all your wedding planning. Cover : Trevor Booth Photography, Windsor, ON. Welcome and congratulations on your engagement. Your wedding is an event that marks the beginning of an important time for you and your fiancé. Our publication,The Wedding Guide offers great information and ideas in an extensive, bridal and wedding planning resource directory, that will assist you in organizing each and every detail of your wedding day. Our smaller, digest size format makes it convenient to carry The Wedding Guide in your briefcase or purse. It’s Free and full of quality. It is a valuable planning companion, practical and specific for this community. Our wedding vendors are reputable professionals who love brides. The Wedding Guide contains checklists, interactive budget calculator (You can browse our Wedding Guide Professionals, get expert bridal planning advice, use our invaluable timetables, checklists, and information on products and services to help keep your wedding plans organized. We help you plan the wedding you have always dreamed about, big or small in Windsor-Essex Counties and Southern Ontario. It’s the inside track on everything weddings with perfect wedding planning at your fingertips. We’ve designed this website to give you a sampling of great wedding information that is available in our publication. With loads of Real Wedding Inspiration Ideas, and highlighted local and current wedding trends. Our wedding planner is COMPLIMENTARY and you may obtain your copy at leading bridal salons or you may purchase a copy by calling our office at 519-252-8463. It is our belief that products and services originate from people who have ongoing professional interest in the wedding market and, we are blessed with many talented professionals in the Windsor/Essex region. Each category on the left side of the website will direct you to a sampling of the vendors, with direct links to their respective websites. You will find many more wedding professionals, throughout the pages of The Wedding Guide. The Wedding Guide has been developed to help you make the correct choices, and to enjoy your engagement; a time that should be filled with joy, hopes and dreams- not stress. Our wedding vendors understand a bride’s needs, and will be there to help you handle all the protocol and details that you are looking for. They love weddings and it shows! Our bridal site is filled with all the pertinent information that you are seeking. Each wedding is based on the personalities of the bride and groom and The Wedding Guide and the Bridal Talk blog delivers all the facts that you need. We wish you a happy life together. Please feel free to email us any time, with any questions you may have regarding weddings in Windsor/Essex County. If there is a service you are looking for that you don’t see, there’s a good chance that we are already speaking with them! The Wedding Guide is FREE for brides-to-be at selected Bridal Salons found on our website, http://theweddingguide.ca. Our services are completely complimentary, so if you have any wedding related questions, please contact us and we’ll help you find services or solve your inquiry. Register now for Special Offers – lots of money saving offers from our pros! 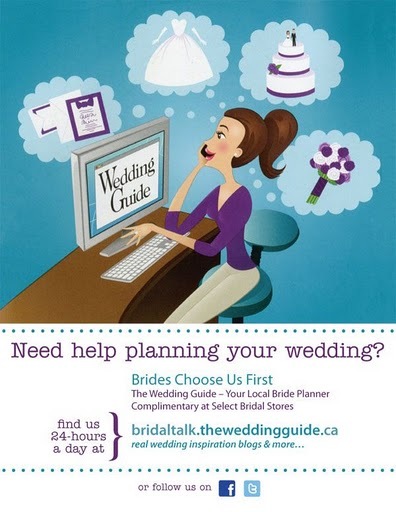 http://www.bridaltalk.theweddingguide.ca – Real Wedding inspiration, Publisher blog, Wedding trends, and Money saving offers for a wedding of your dreams.